This is from the Institute on Tax and Economic Policy (ITEP). The final tax bill that Republicans in Congress are poised to approve would provide most of its benefits to high-income households and foreign investors while raising taxes on many low- and middle-income Americans. The bill would go into effect in 2018 but the provisions directly affecting families and individuals would all expire after 2025, with the exception of one provision that would raise their taxes. To get an idea of how the bill will affect Americans at different income levels in different years, this analysis focuses on the bill’s impacts in 2019 and 2027. The graph below measures the average tax change resulting from the bill as a share of income for each income group, which is a way of showing how the income of a typical family in each group would be changed. In 2019, the bottom three-fifths of Americans will receive smaller average tax cuts, as a share of income, than other groups. In 2027 the bottom three-fifths of Americans will see tax hikes, on average, while the typical households in one of the other groups will continue to receive tax cuts, albeit smaller ones. 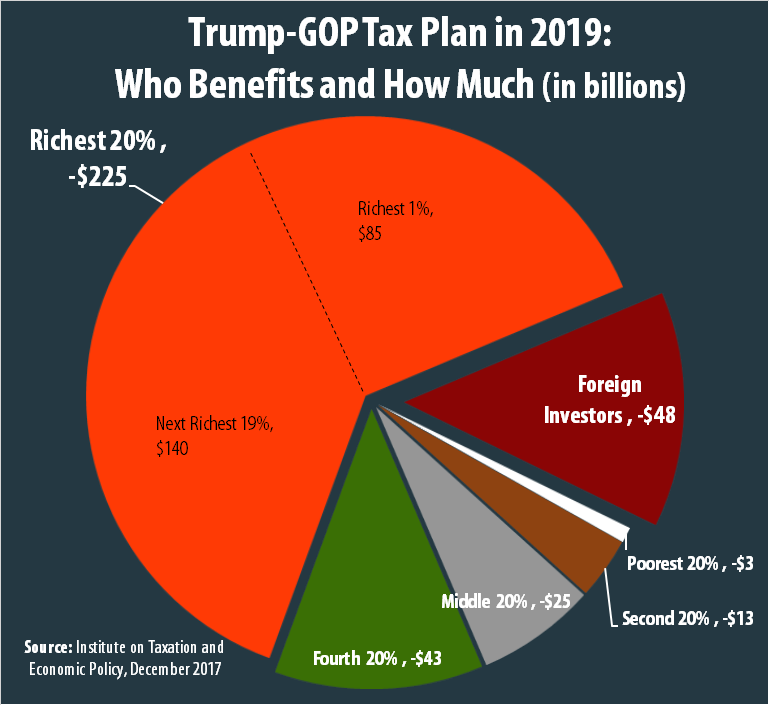 The graph below divides Americans into five equal groups based on income and illustrates how only one of these groups, the richest fifth of Americans, will receive more benefits from the tax bill than foreign investors. This is because the biggest tax cut in the bill is the reduction in the corporate income tax rate from 35 percent to 21 percent. As explained later in this report, the corporate tax cut will mainly benefit those who own shares in American corporations. While some middle-income people own shares, most are owned by high-income Americans and foreign investors. Focusing on the bill’s benefits for Americans, we find that in 2019 more than half will flow to the richest 5 percent of taxpayers, and more than a quarter will flow to the richest one percent of taxpayers. In 2019, the average impact for the middle-fifth of taxpayers will be a tax cut of $800. The richest one percent of taxpayers will receive an average tax cut of more than $55,000. The average tax cut for richest one percent in 2019 will be larger than the average income for the middle-fifth of taxpayers, which will be about $53,000 that year. The bill produces this distribution of benefits because so many of its provisions help the well-off, including a reduction in the estate tax, a reduction in the top personal income tax rate, a reduction in the corporate tax rate benefiting corporate shareholders, and a special deduction for other business-owners. The provisions affecting low- and middle-income families are more of a mix of tax-cuts and tax hikes, as explained below. Economists generally agree that the benefits of corporate tax cuts initially go to those who own stocks in American corporations. Recent research has concluded that foreign investors own 35 percent of stocks in American corporations and would therefore receive a significant share of the benefits from corporate tax cuts. Many economists believe that by the end of the decade some of the benefits of a corporate tax cut would go to workers in the form of higher wages. It is very unclear when or if this would ever happen. But ITEP follows the approach of Congress’s official revenue estimator in assuming that, by 2027, one-fourth of the benefits of the corporate tax cut would go to workers, which would mean the benefits are a little less concentrated on the rich. But even this assumption does not change the fact that the corporate tax cuts provide the richest taxpayers with the greatest benefits. The bill also includes a 20 percent deduction, with certain limits, for income from pass-through businesses, which are businesses with profits subject to the personal income tax instead of the corporate income tax. While some equate these enterprises with “small businesses,” they include law firms, hedge funds and many enormous companies. Most pass-through income flows to the richest one percent of Americans. Another break that favors the wealthy is the bill’s provision to double the amount of assets that can be left to heirs without triggering the estate tax from $11 million for a married couple to $22 million. Under current law only 0.2 percent of estates are taxed, which means reducing the estate tax can only benefit the very wealthiest families. The bill would repeal the existing requirement for individuals to obtain health insurance. The figures in this report incorporate the estimates of the Congressional Budget Office on how this change would affect taxes. The existing penalty tax that is imposed on those who do not obtain health insurance will be eliminated, which will reduce taxes for some. But a larger group of people will pay higher taxes because when they go without health insurance, they will no longer collect the tax credits that help them pay premiums under the Affordable Care Act. The tax changes that affect families and individuals most directly, the provisions that most families think of as affecting their bottom line, are a mixed bag for low- and middle-income people. Some of these provisions would cut their taxes, like the increase in the standard deduction and child tax credit. Others would raise their taxes, like the repeal of the personal exemption that taxpayers can claim for each member of their family and the new $10,000 limit on the deduction for state and local taxes. Some high-income taxpayers would face tax hikes because of the limit on state and local tax deductions, but others would benefit more from the reduction in the top personal income tax rate from 39.6 percent to 37 percent, as well as other breaks in the bill. In 2019, the average tax change for each income group would be a tax cut, but it is nonetheless the case that many taxpayers in each income group would face a tax hike that year. In 2027, the share of Americans facing a tax hike would be much higher, and the average change for the bottom three-fifths of Americans would be a tax hike. The impacts on low- and middle-income people are worse in 2027 because the provisions that directly affect families and individuals all expire after 2025 — except for a provision that raises taxes by adjusting the tax code to a slower measure of inflation called the “chained” consumer price index (chained CPI). This means that in years after 2025, the tax provisions relevant to families and individuals will return to what they are today, except that chained CPI will gradually push households into higher income tax brackets and will make most deductions and exemptions less generous over time. However, the corporate tax cuts are permanent. This means that in 2027, the main provisions in effect are a tax hike that affects low- and middle-income families (chained CPI) and the corporate tax cut that mostly benefits well-off Americans and foreign investors.